Besides medication there are various helps available in coping with my condition such as regular exercise, minimizing stress, healthy meal, regular sleep and recreation, etc etc. In the recent weeks, my health has been fluctuating as I am managing more stress in terms of my freelance work and other challenges in my life. The last few days have been particularly trying as I have been experiencing panic attacks due to some stressful situations. Stress and strained are my main triggering factors in my condition and so I am looking to the Lord daily for grace and wisdom to manage. I thank God for His faithfulness in seeing me through the many challenges and for strengthening me. Thank God that His Words have bring great encouragement and comfort to me this week as I searched through them in the face of various challenges. Thank God for the joy of worship and fellowship on the Lord's day. Thank God for a soul-searching message on maintaining a right relationship with God's children that will please God. Thank God that the church Aunty who went through the surgery last Tuesday was able to come for worship last Lord's day and we had a blessed time of fellowship. Thank God for family and friends who puts up with my many limitations and loved me just the way I am and help me to grow in many wonderful ways. Their love and support is precious to me. Thank God for my mother who takes such wonderful care of me even while I seek to care for her. Thank God for my sister's family for spending time with my mum and me this week. Thank God for 2 friends who helped me to brain-storm some difficult decisions recently and helped me to learn and grow through these difficult experiences. Thank God for enabling me to complete one freelance assignment ahead of time and enabling me to start on a new one now. Thank God for His provisions. Thank God for providing for my daily bread and so many blessings in His wonderful ways, and through the kindness of His beloved people . Thank God for Iris' labours of love in hosting Thankful Thursday. Thank God for the joy of participating on Thankful Thursday. Reading the various encouraging Thankful Thursday posts on so many blogs have helped me to count my blessings and be more thankful. Sometimes when the road is tough and the days are difficult, it is easy to forget that God is still with us and have shower us with many blessings. So I am thankful to God that through Thankful Thursday I can step aside from the challenges of the day, the tiredness, the stress and whatever else, to just reflect upon God's blessings and goodness to me. Praise Him that I do have many things to be thankful for! Thank God for all of you, my dear blogging friends, other friends and readers, for stopping by, reading my posts and encouraging me by sharing with me your thoughts and reflections either via comment or email. Thank God for the many blogs that I can visit daily and all the encouragements I derived from your blogs. Thanks for sharing your life with me. It is so wonderful to find such friendships and support online. God be praised! How about you? How has the Lord blessed you through the past week? Thanks for stopping by. Hope you have a blessed and thankful day! Bless you for being thankful, even during the hard times. I am praying for you. Oh what a beautiful list! You have such a tender and grateful spirit, it's a joy to know you. Sorry you had a difficult past week. I pray things continue to improve for you. This is a lovely list. We all certainly have a lot to be thankful for each day! Keeping you in my thoughts and prayers. Lord, touch nancie with your mighty healing hands. thank you, Lord. thank you for sharing your heart with us. God bless! Nancie, It is such a joy to see give praises and thanksgivings to God even when you are struggling. I have added your name to my prayer list. I have lived with depression all of my life and know how much harder it must be for you. Keep your eyes heavenward and your faith whole. He will guide you through this situation that is causing panic attacks and stress. I'll be praying for you as you manage your illness. A great list, Nancie. Isn't it wonderful that we continue to have so much to be thankful for, even when life is tough. I'm thankful that I overcame the feelings of anxiety and depression that washed over me a couple of days ago. With my bipolar condition that's always a worry. But God has helped to restore me - what a great thing that is. Yes, I'm thankful too. What a lovely and gracious woman you are. Your Thankful Thursday posts are always a blessing to me. So precious to see how your trials only cause you to cling tighter to our Lord. Like you, I am amazed how He uses blogs and comments from fellow sojourners in blogworld to bring encouragement to our hearts and lives. Blessings on this TT! Wonderful post ..so glad you shared with. It is so hard to share when you feel bad...I think it says alot about you to post when you had such a difficult week. When I go throught things I tend to shut down. Thanks for encouraging me to keep pressing on! 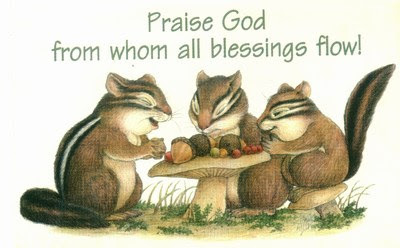 *Hugs* God bless you dear Sister; That is so cute the graphic you have at the end of your TT post; I'm so sorry to hear about the week you have and Praise God that He is always there when we need Him the most; We have a loving and mighty God whom, when we are weak, He is there to be strong for us! What an amazing list you have put together. The Lord is the strength of our heart and our portion forever. It does not have to be well with our circumstances to be well with our soul. I am so grateful that you are getting help and speaking out about your condition. It will help so many. I have several friends who have this condition also. I know how very difficult your life is. Oh, praising the Lord that He is your strength. It's neat to hear that God is strengthening you so that you can manage your medical condition. It sounds like you really trust Him and love Him. Nancie, I LOVE the verse with this post, and I LOVE your thankful list! This has been a tough week for me also with stress and a little depressive episode. However, the Lord has seen me through, as always. I just can't make it without Him! Thanks, dear friends, for stopping by. Thank you for your prayers, encouragements and kind comments. It is so wonderful to experience such support from all of you. I thank God for all of you! Take care and God bless. I am so glad that your medication is working well, so you can work on your free-lance jobs. How cool. It is also wonderful to come together as a body of Christ to receive encouragement. Thanks, Iris, for hosting Thankful Thursday and the blessing it has been to so many of us. May God continue to bless your labours of love and keep you near to Him.